It’s rare I drink soda anymore. Some years ago, I ended up with a kidney stone, after being asked “how many sodas do you drink a day?” [my answer was “I refill my 64 oz. mug at least 2 times a day”]. So yeah, scared me a bit… errr. a LOT. When I do drink a soda, it’s normally because I’m curious about a new flavor. In this case, the Mountain Dew Baja Blast. The last soda I had was a Sprite the other night, which I normally mix with Crown Royal Black. I prefer the lighter sodas, so the light green hue of this flavor was a draw. Opening up the cap [which I do slowly – never know how shaken up these bottles get], the smell was good. Taking my first sip, I anticipated good. And yes, the taste is actually pretty good. Flavor wise, I tasted pineapple as the biggest taste. Not overly sweet and the overall flavor of the soda is very consistent between sips. I don’t anticipate drinking this often, but it’s one that I might find myself buying again in the future. Although the bottle says LIMITED TIME ONLY, which I would guess this summer will be the last time to find it in stores. Making an exception would be if they brought back Pitch Black, which is my all-time favorite Mountain Dew flavor. 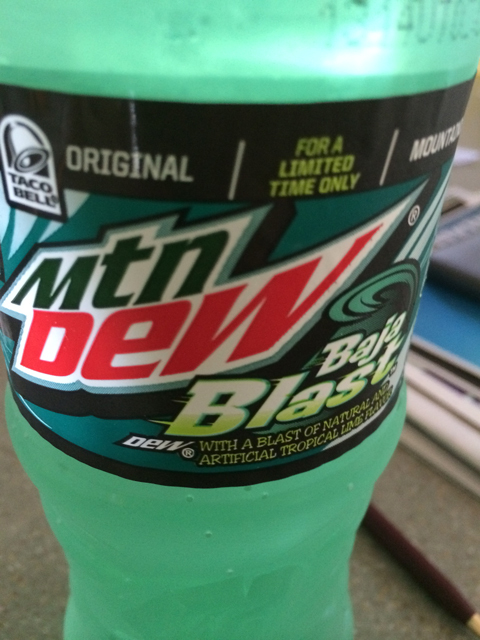 If you are a fan of soda, you should try the Baja Blast. If you are a “DO THE DEW” drinker, then you have no excuse not to try this. Anyone else try this Baja Blast flavor? Post your thoughts below. I don’t drink soda anymore, with the exception of a xylitol sweetened soda I found at Whole Foods once in a blue moon, so I doubt I’ll try this flavor. But it was bugging me that this was familiar and now you’ve clarified that it used to be fountain only at taco bell. Man that was bugging me. It’s also available in Slurpee format at 7-Eleven. I like Baja Blast quite a lot. It goes great with the Cantina Bell Menu at Taco Bell!